Here's our sight word shell game for this month. My students LOVE this game. Unlike the traditional shell game I don't shuffle the boxes. Instead we work on reading and memory. I (or one of my parent volunteers) hide the chick and they must read the word before I lift the box. This is very motivating for students who need more practice on sight words! If you would like to play this game, you can pick up these adorable EDITABLE chicks HERE. Thank you to Cutesy Clickables for their talent and oh-so-cute clip art! I scored the wind up chick from the Dollar Tree store, but any toy or colorful egg will work. Use what you have! I found the ice cream cups in the party section at the Dollar Tree at just 8 for $1. You can also do the same game with colorful take out boxes found in packages at the Dollar Tree or large styrofoam or paper cups. This product can be used for oodles of other games as well. 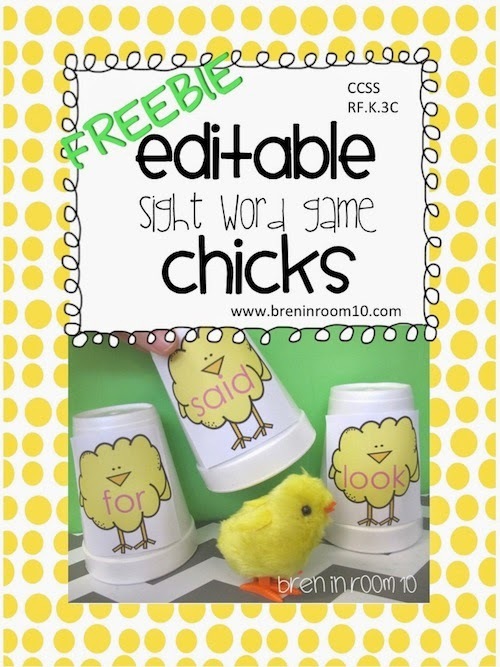 Make two sets of sight words chicks and you have a matching (memory) game. Sorting, ABC order, number sequencing would all work. Type in CVC or CVCE words or numbers and let your imagination run wild! I love this idea! My kinders are going to go bonkers for this game next week! So simple- yet so effective! Thanks for sharing! What a cute, cute game! Thanks for the freebie!